How did Digital Tao Studios get started and tell us a bit about your work? My wife Jodi and I founded Digital Tao Studio in 2006 as our previous production company (Music Media Online) began evolving from music, flash/web and graphic design into more high-end Film, Animation and TV work. Since then we have produced local and international award-winning film and music-video projects, national TV advertising campaigns and multicam live events coverage. Our aim is to provide speciality post-production services that raise overall production value but have been a challenge to source regionally, like Advanced Compositing, Visual Effects and Animation. We feel it empowers local film makers and artists to have access to a broader creative palette than their own skills or experience may afford them, thereby evoking a greater sense of possibility for the vision of their projects and promotions. 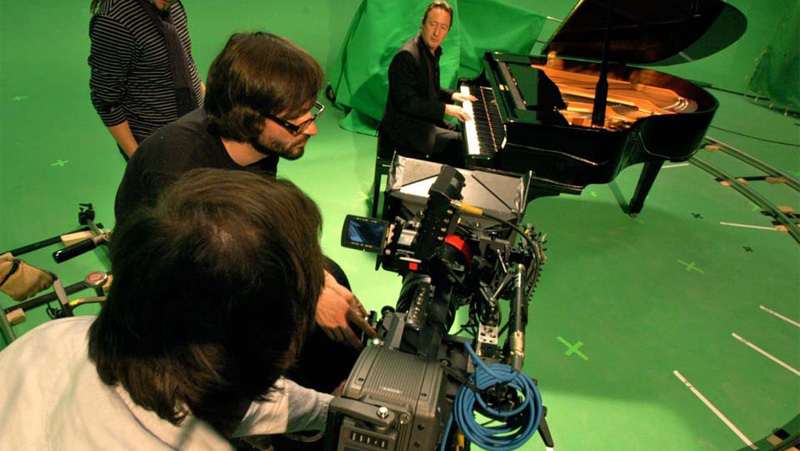 How did you get involved in the Julian Lennon’s Visual Album Project? Digital Tao has worked on and off with Julian since the Whaledreamers film in 2005 where I was Editor and Supervising Producer and Jodi led the 100 voice choir and was a Soundtrack co-Producer/Arranger. We also did all the post on Julian’s first interview in 10 years and his Saltwater 2008 music video with Greenpeace, so when I heard he’d finished recording the new album I asked him where his music videos were up to. He told me how he was wanting to produce a “visual album” where every song had it’s own clip, so from there we started discussing ideas for each song and 2 months later I was on a greenscreen soundstage in London directing a 30 person crew shooting all 12 songs with him. After the shoot I returned to our studio in Uki with over 8TB of 1080p444 footage and we got started on the epic post-production journey ahead of us. I gathered a small local team and trained them in the keying and greenscreen clean up tasks they’d be doing for weeks while got on with building 3D virtual sets, plotting vfx sequences and composites and editing. There was a lot of video conferencing and uploading and IM chats and emailing with Julian and the UK team about vast stock footage selections and overall project direction. As with all music video productions, it was about creating a visual work that resonated with the lyric and feel of each song and I’m proud of the work we produced and the amazing response from Julian fan base. My favourites would probably be Everything Changes, Lookin’ 4 Luv and the stop-motion one Guess It Was Me that was produced entirely in our Uki studio. Who are some of you clients? Jodi and I both began our careers at a young age and have an extensive history in both production and advertising/marketing industries. Jodi comes from a family of esteemed theatrical producers and really has producing in her blood. I began my professional production career at age 16 operating my family’s commercial recording studio in Mullumbimby before moving to Sydney in 1993 to work in studios there. Over the years we have supplied content to every TV network in Australia and worked with clientele and projects as diverse as Diesel (of the Injectors), Monty Python’s Spamalot, Billy Elliot The Musical, Greenpeace, Planet Ark, Cannes Film Fesitval, Gloria Jeans, David Jones, Whaledreamers Film, Gladiators TV, Kasey Chambers, Tommy Emmanuel, Man Of The Trees film, Troy Cassar-Daley, Lee Kernaghan, TORA, Nikka Costa, Steve Balbi, The Bolshoi Ballet, SEGA, Telecom, Maggie Dent, NCEIA, Spa Australasia magazine, GRM International and AUM Marketing. What is most important to you in running a successful and creative regional business? HIGH SPEED INTERNET !!! [LOL] No but seriously ADSL2 in Uki really has enabled us to efficiently work with clients like Julian all around the country and the world from our rainforest production studio. Also high speed access helps expedite research and to stay abreast of global trends in creative works and technology, which is vital because this is a ‘creative technology’ business we’re in. We believe the synergy of creativity and empowering technical tools is a foundation of modern relevant film making, so staying current and informed in this industry of constant innovation is a key factor. Another important aspect of successful regional business for me is to consciously engage with our local creative community and industry peers whenever the opportunity arises and feels right. Yes the internet is invaluable in helping maintain relationships and quelling that feeling of isolation that can creep in when working long hours alone in your studio, but nothing can replace the benefits of gathering face to face with like minds and sharing stories and ideas and exploring potential for collaborations that are mutually beneficial. Screenworks is such a valuable resource in this and so many ways. We are always happy to meet more of our local creative community and so welcome our industry peers to visit our facility up here at the foot of the Mt Warning National Park. We’re just 45min from Byron or Bangalow so come meet with us and let’s discuss that impossible shot or treatment concept you can barely let yourself imagine! Bringing dreams to the screen is our passion. You can contact Chris and Jodi on 02 66 795468 or studio@digitaltao.com.